System of a Down (acronym as SOAD) is a well known American alternative metal band, formed in 1994 in Los Angeles, California, USA. The music of System of a Down reveals the Armenian heritage of the four members, fusing furious alternative metal with folky flourishes and reaping platinum-selling commercial success. 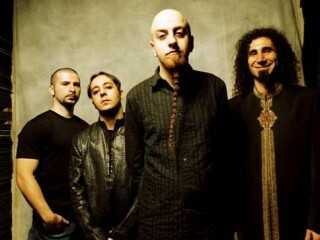 The band consists of Serj Tankian (vocals), Daron Malakian (vocals, guitar), Shavo Odadjian (bass, vocals) and John Dolmayan (drums). The band released a series of demo tapes in the late 1990s. Finally Demo Tape 4 reached the attention of the record labels resulting in their first studio outing, 1998’s System of a Down. They supported this album by touring widely, joining Slayer, Fear Factory and Incubus among others. The second album, Toxicity (2001), was a huge success, going on to sell over six million copies across the world. Among the singles were “Chop Suey!”, which won a Grammy, “Toxicity” and “Aerials”. Steal This Album! was released in 2002, with a title that related to the fact that several previously unreleased tracks had found their way onto the internet. In May 2005 Mezmerize was released, the first of a double album in which the two halves were released six months apart. Hypnotize was duly released in November, and both debuted at No.1 in the Billboard charts. After touring in support of the two albums System of a Down announced that they would be taking a break, though they insisted that this was not a roundabout way of breaking up. In the meantime Malakian and Dolmayan have been working with Scars On Broadway, and Tankian released a solo album Elect The Dead in 2007. Odadjian is planning a project with Wu-Tang Clan producer RZA. System of a Down has achieved commercial success with five albums, and many singles such as their breakout hit “Chop Suey!”, “Toxicity”, “Aerials”, “B.Y.O.B.”, “Question!”, “Hypnotize” and “Lonely Day”. Their works have earned them one Grammy Award amongst three nominations. System's first tour through Mexico and South America began on September 28, 2011 in Mexico City, ending in Santiago, Chile on October 7, 2011. From late February to early March 2012, they headlined five dates at Soundwave festival. This was the band's first visit to Australia since 2005. Asked in October 2011 whether System of a Down will record a new album, drummer John Dolmayan replied, "We're gonna take it day by day. [...] For the people who are waiting for an album — I know there's a lot of people waiting for an album; I'm waiting for an album just like they are. It's gonna happen when it's right and when we can make something that tops what we've done in the past. Because we don't really wanna rest on our laurels — where what you've done in the past is what you depend on. Well, I don't wanna do that, and I know the rest of the guys don't wanna do that. Instead of resting on our laurels, we wanna throw them away and create something new and specific for this generation that they can say that's their System of a Down." On August 11 and 12, 2012, System will play the Heavy MTL and Heavy T.O. music festivals in Montreal and Toronto, respectively. On April 23, 2012, it was announced on the band's website that they would do a summer tour of the eastern United States and Canada with special guests, Deftones. View the full website biography of System Of A Down (band).